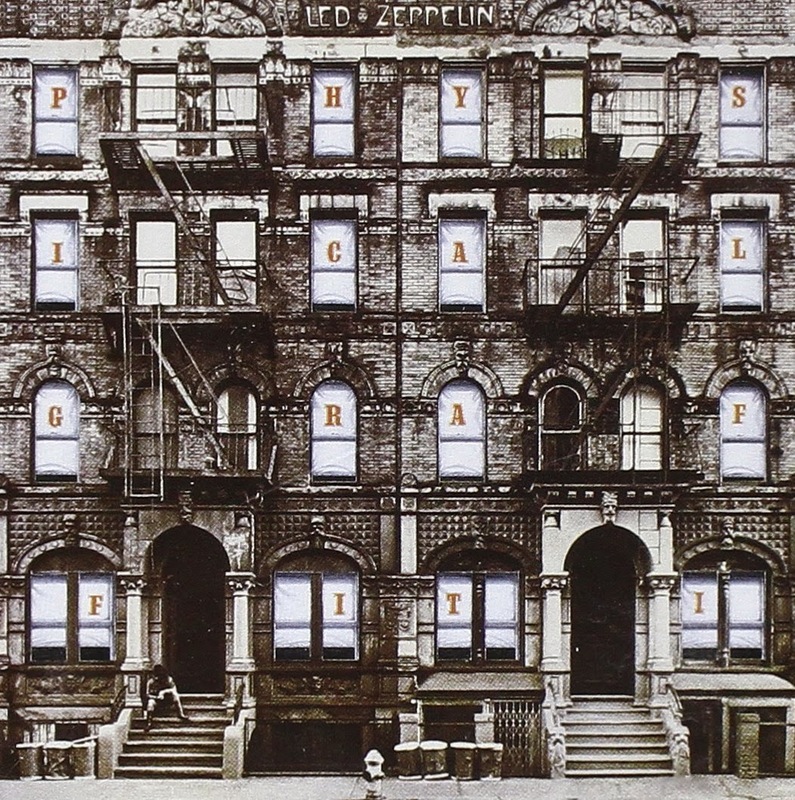 Next up in line in the Led Zep re-releases is album number 6, Physical graffiti. As I wrote in my review of 'IV', this is the album that I sort of stopped following the band on rediscovery in the 80s. Yes, the double cd is in the home since somewhere in the 90s, but I haven't played it that often. Lets go for that reassessment now that I'm on this series. Only two to go after this. Not counting live albums. Somewhere I read that Physical graffiti was a leftovers album that the band expanded with a few new songs. Until the 1990's I had never really listened to this album. With the MTV Unplugged show of Plant and Page 'Kashmir' came into my life. There's no discussion there. This song is up with the great ones of this band, but how does the rest do? 'Custard pie' is a left over, obviously. It's a variation on what has been done better before. Yes, the song rocks, the mouth harp even almost makes it come alive, but it never sparkles like songs in the past with a bouncy rhythm like this did. It's good, but the band was better. 'The rover' has an interesting intro, but I get the feeling that Led Zeppelin does a ZZ Top here. It's only when Robert Plant opens his mouth, the song grows and comes up with a vocal melody ZZ Top never, ever came close to. The same goes for the third, fourth or fifth guitar Page plays in the choruses and solo. It makes 'The rover' come on top. Absolutely no complaints here. 'In my time of dying' is another one of these mysterious Led Zep rockers. A lot of things musically and rhythmically are going on. Bonham pounds away in the background giving the song an enormous power. The slow sliding riff at the start brings us to things Moroccan, the slide riffs later on deep into the U.S's swampy, brooding south. Musical globalisation in 1975. Ten minutes plus of musical adventure 'In my time of dying' is and nothing else. 'Houses of the holy'? Yes, the song is on Physical graffiti and not on 'Houses of the holy'. And truth be told, 'Houses of the holy' would have been a flag on a mudship. A totally just left over if I ever heard one. There's nothing special about the song that I can find or it has to be that there's a who-who-who in the background, which is fairly unusual for this band. Even Plant sounds bland and has his whine on. Almost always a sign that the song isn't too good. The funky stuff of 'The bridge' is here, but not the oomph, the kick, the making me feel alive guts and glory. Once I saw a band called Trampled Under Foot play. Two brothers and a sister. The review is on this blog somewhere in the past. Guess where the band got its name from? I would have called myself Kashmir (oh, that one is taken?) instead. 'Trampled under foot' is o.k. though. Finally John Paul Jones gets to excel. A nice organ solo! The song has that Led Zep magical rhythm and Plant holds back in giving it all, finding just the right mix. The song being a riff in one chord, makes it hard to find a great vocal melody. This is compensated by the guitar and organ. Oh, yeah. At this point into the album the magic really starts. Led Zeppelin takes us straight into a war zone of decades and is able to turn it into a sort of haven and peace zone. I wonder who decided to turn this song into what it became. My hunch is Jones, but I'm not sure. Switching to Wikipedia I'm proved right. Although Jones had nothing to do with the writing (even John Bonham is credited), he should have. The whole atmosphere is in the orchestration and that was all his work. Another fact is that the work on the song started in 1973 and went on for over a year into 1974. Brick by brick really. The bridges in this song make it even greater as it brings in the variation that allows 'Kashmir' to go from good to great. There is so much going on that I do not have enough ears to keep up. The rhythm, the riffing, the singing, the rhythm patters, the orchestration. There is so much to follow that I can listen to 'Kashmir' time and time again. Highlight of Physical graffiti it is for sure and more. One of the greater rock songs of all time. 'In the light' starts just as mysterious, a fog horn on an organ. Eastern, emulating snake charmer's music. Plant singing double tracked, with minor changes in sound and performance. No way that this is another 'Kashmir', but the band manages to catch a certain mood. It's when the band kicks in 'In the light' loses some of its magic and becomes an average Led Zep song. Over 8 minutes is also a bit long for a none magical song. 'Bron-Yr' is an folksy instrumental in which Jimmy Page shows some of his prowess on the acoustic guitar. 'Down by the seaside' takes the mood down, a lot. A very un-Led Zeppelin song. a song in which the teeth and claws of the band have been clipped forever. A sort of poppy outing into a sixties pop song. And still it isn't bad at all. The twist comes unexpected, so as a surprise. 'Ten years gone' is another slower song and not one of the best the band recorded. The problem here is that they have recorded and released a lot of songs like this that are simply better. It can't compete with what went before. For any other band this would most likely have been a great song. What is also showing by now is that it is becoming just a little bit too much Led Zeppelin for me. The charm's fraying this deep into Physical graffiti. Listening further into the album it is also clear that there is not going to be anything touching on the quality of 'Kashmir'. 'Night flight' has a great change into the chorus, but is a fairly simple rocking blues. The riff on 'The wanton song' is a return to form. 'Boogie with Stu', is exactly what the title says. The Rolling Stones' sixth member until his death in 1985, Ian Stewart, is boogieing away on his piano. Fun, not more and should have been on an anthology album somewhere in the past years. Physical graffiti is petering out slowly. If Led Zeppelin had just released one album instead of a double one, it would have ranked quite nicely between 'III'. 'IV' and 'House of the holy'. Now it's trailing behind a little, but hey, this is Led Zeppelin. Their standard is just so terribly high.